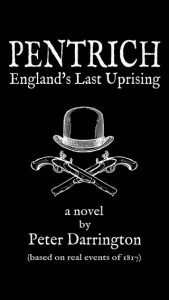 We’re offering 20% discount on price for pre-orders of Peter Darrington’s debut novel, Pentrich: England’s Last Uprising. The book is available in two sizes of paperback and as an eBook for Apple devices. The Kindle version will be available via Amazon on publication day, 9 June 2017. The novel is based on the real events of 1817 and publication comes on the 200th anniversary of the fated march. The story focused on George Weightman, who wants only to feed his young family and earn a fair wage when he joins a secret network of radical thinkers dreaming of parliamentary reform that eliminate poverty in a post-Napoleonic war torn England. But as Plans escalate out of control along with egos and selfish motivations, an attempted working class revolt to destroy the government goes horribly wrong with cataclysmic results for everyone involved. Following his play of the same name, the novel is Darrington’s first. He said, “I’m delighted to have finished this book. Not only is it to be published on the two hundredth anniversary of these now almost forgotten events that were a national scandal at the time, but you can explore so many more aspects of the story and the characters with a novel than you can a play. It is the first publication from us as Reckless Yes Publishing, bringing the DIY ethos of our record label to the publishing world, and we have a second novel set for release later in 2017. Get a 20% discount when you pre-order your copy of Peter Darrington’s Pentrich: England’s Last Uprising – buy here.